4141 Design and Extremis cordially invites you to Art Basel, Beer Garden in the Atrium. Wednesday, November 30th from 3-5 p.m.
Come enjoy authentic Belgian beer on tap and meet the designers of Extremis outdoor furniture. Event will be held in the atrium. RSVP requested by November 23rd. 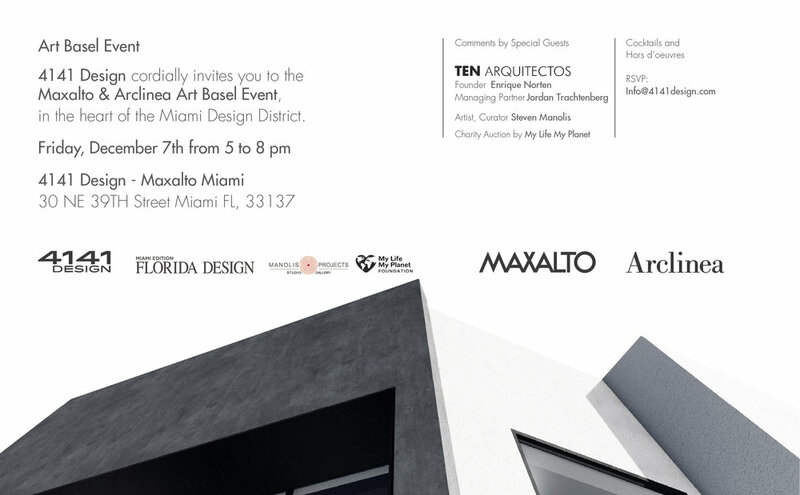 4141 Design cordially invites you to our Art Basel event featuring Italian luxury brands MAXALTO and ARCLINEA. Thursday, December 1st from 5-8 p.m.
Italian fare and prosecco will be served. Come see the work of abstract expressionist painter J. Steven Manolis. Named Art Basel 2016 artist of the year by Books and Books. Don’t miss a short presentation at 7 p.m. by legendary art critic Bruce Helander regarding the importance of the integration of art, style and it’s effect on furniture. Join us Saturday, October 1st for exclusive discounts. Come join us for an event filled with food, refreshments and live entertainment. B&B Italia is celebrating the 40th anniversary of Maxalto, the company brand that stands out for the “new classic” flavour of its collections. Blending sophisticated craftsmanship with the most advanced technology, Maxalto has a consolidated wealth of tradition, authenticity and know-how, and owes its success to the balanced mix of past and present. Its contemporary classic furnishings combine excellent materials, meticulous workmanship, exclusive details and customised solutions. Founded in 1975 alongside B&B Italia, Maxalto soon developed a personal identity in specialized production of artisan furniture. Today Maxalto is an established brand. Although very distinctive, the five Maxalto collections reveal a common and coordinated spirit, proposing elegant interiors for those who seek tradition with a contemporary twist.